Test great Rahul Dravid attended the marquee La Liga clash between FC Barcelona and Atletico Madrid at the Camp Nou on Sunday. 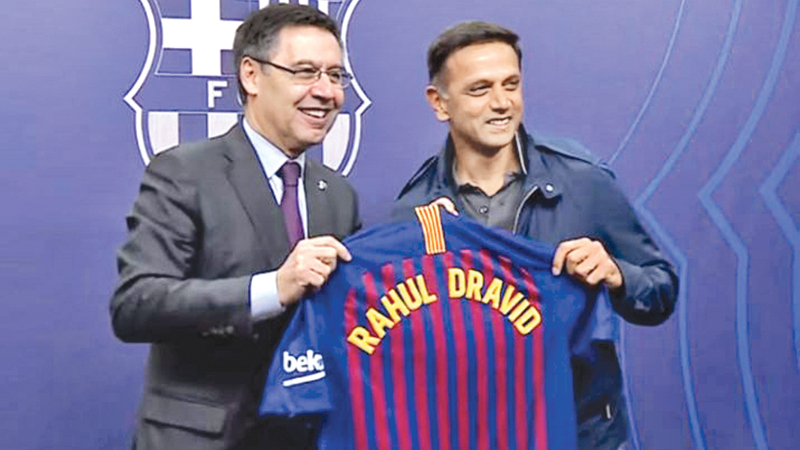 Dravid, who is also the brand ambassador of Indian Super League (ISL) champions Bengaluru FC, was presented with a customised Barcelona jersey on his visit to the historic venue. The former India cricketer, in an interview posted by the Catalan club on their official Facebook account, shared his experience about watching the match. “It’s incredible, it’s a huge honour, it’s one of the things I’ve always wanted to do - come to Camp Nou and watch a football match. To be here and experience the atmosphere, it’s absolutely electric,” Dravid said. The 46-year-old was all praise for five-time Ballon d’Or holder Lionel Messi and said, it was fantastic to see his ball control. “To be able to watch players like Messi and Suarez play live, it’s fantastic for me and my family. Thanks to Barcelona FC for the hospitality, it’s been excellent,” Dravid said.